Human body estimation methods transform real-world observations into predictions about human body state. These estimation methods benefit a variety of health, entertainment, clothing, and ergonomics applications. State may include pose, overall body shape, and appearance. Body state estimation is underconstrained by observations; ambiguity presents itself both in the form of missing data within observations, and also in the form of unknown correspondences between observations. We address this challenge with the use of a statistical body model: a data-driven virtual human. This helps resolve ambiguity in two ways. First, it fills in missing data, meaning that incomplete observations still result in complete shape estimates. Second, the model provides a statistically-motivated penalty for unlikely states, which enables more plausible body shape estimates. Body state inference requires more than a body model; we therefore build obser- vation models whose output is compared with real observations. In this thesis, body state is estimated from three types of observations: 3D motion capture markers, depth and color images, and high-resolution 3D scans. In each case, a forward process is proposed which simulates observations. By comparing observations to the results of the forward process, state can be adjusted to minimize the difference between simulated and observed data. We use gradient-based methods because they are critical to the precise estimation of state with a large number of parameters. The contributions of this work include three parts. 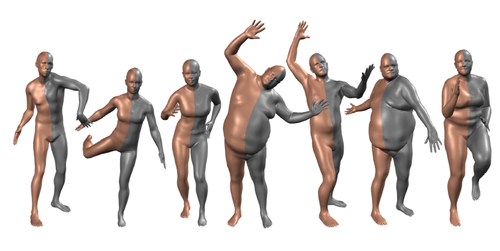 First, we propose a method for the estimation of body shape, nonrigid deformation, and pose from 3D markers. Second, we present a concise approach to differentiating through the rendering process, with application to body shape estimation. And finally, we present a statistical body model trained from human body scans, with state-of-the-art fidelity, good runtime performance, and compatibility with existing animation packages. Computer vision can be understood as the ability to perform 'inference' on image data. Breakthroughs in computer vision technology are often marked by advances in inference techniques, as even the model design is often dictated by the complexity of inference in them. This thesis proposes learning based inference schemes and demonstrates applications in computer vision. We propose techniques for inference in both generative and discriminative computer vision models. Despite their intuitive appeal, the use of generative models in vision is hampered by the difficulty of posterior inference, which is often too complex or too slow to be practical. We propose techniques for improving inference in two widely used techniques: Markov Chain Monte Carlo (MCMC) sampling and message-passing inference. 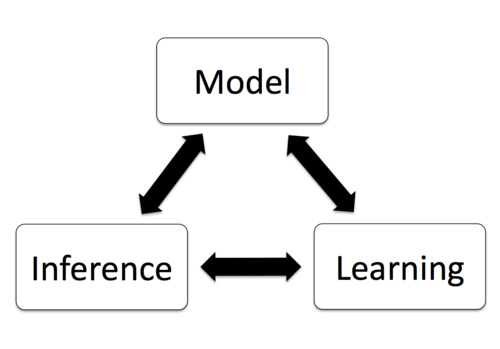 Our inference strategy is to learn separate discriminative models that assist Bayesian inference in a generative model. Experiments on a range of generative vision models show that the proposed techniques accelerate the inference process and/or converge to better solutions. A main complication in the design of discriminative models is the inclusion of prior knowledge in a principled way. For better inference in discriminative models, we propose techniques that modify the original model itself, as inference is simple evaluation of the model. We concentrate on convolutional neural network (CNN) models and propose a generalization of standard spatial convolutions, which are the basic building blocks of CNN architectures, to bilateral convolutions. First, we generalize the existing use of bilateral filters and then propose new neural network architectures with learnable bilateral filters, which we call `Bilateral Neural Networks'. We show how the bilateral filtering modules can be used for modifying existing CNN architectures for better image segmentation and propose a neural network approach for temporal information propagation in videos. Experiments demonstrate the potential of the proposed bilateral networks on a wide range of vision tasks and datasets. In summary, we propose learning based techniques for better inference in several computer vision models ranging from inverse graphics to freely parameterized neural networks. In generative vision models, our inference techniques alleviate some of the crucial hurdles in Bayesian posterior inference, paving new ways for the use of model based machine learning in vision. In discriminative CNN models, the proposed filter generalizations aid in the design of new neural network architectures that can handle sparse high-dimensional data as well as provide a way for incorporating prior knowledge into CNNs.